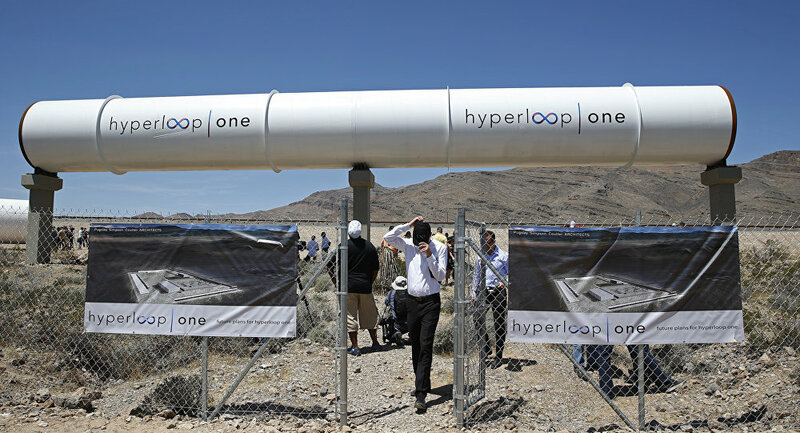 Hyperloop One, being developed by Tesla and Space X boss Elon Musk, will involve whizzing human as well as non-human cargo through a tube at speeds of up to 700mph. This would be achieved by gradual acceleration via electric propulsion through the low-pressure tube. The company conducted a "global challenge," calling on individuals, universities, companies and governments to develop a "comprehensive commercial, transport, economic and policy case for their cities, regions or countries to be considered to host the first Hyperloop networks." An image showing passengers boarding the Hyperloop transportation system. At the Vision for Europe summit, a consortium of think tanks and foundations collaborating to address some of the most pressing public policy challenges facing Europe, Hyperloop One was discussed. Specifically, its plans to establish a network of routes, which would cover more than 3,100 miles and connect over 75 million people in 44 cities. It is hoped that by the end of 2017, Hyperloop One will have a team of more than 500 employees, all of them tasked with bringing the technology to life. "Europe embraces new ideas in transportation like no other region in the world and is uniquely positioned to take the next great leap in transportation with Hyperloop One," said Shervin Pishevar, co-founder and executive chairman of Hyperloop One. The proposed routes would, Hyperloop says, greatly reduce passenger and cargo times across some of the continent's "most heavily trafficked" region. The company has, to date, built a short test tube; however it will be years until anything else is developed.